The first requirement for going to Chenonceau is a good alarm clock. It is infinitely more beautiful when you have it to yourself. You want your approach to look as much as possible like the photo above. Even a little later in the day, this walkway is crammed. It’s easy to buy tickets from the machines outside the gates, so you can politely hover right beside the gate and wait for it to open. Tickets are also sold online but I had the luxury of waiting for a sunny day in May, so I waited until the last minute. (The previous day, I had tried arriving late in the afternoon and found the parking lots and walkways jammed). The tower to the right of the chateau dates from around 1230, the only part remaining of the original manor. It was later gussied up in Renaissance style, especially the window and door decorations. You’re at the doorway, the same door used by Diane de Poitiers, Catherine de Medici, and Francois I. Mary Queen of Scots married the Dauphin of France at Chenonceau in 1558. He died as Francois II in 1560, leaving her a teenaged widow. 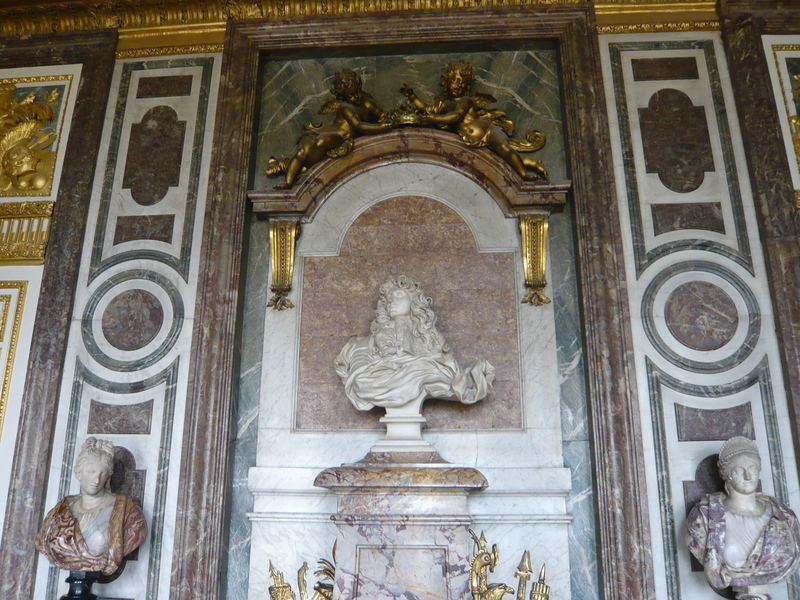 Louis XIV, the Sun King himself, walked through this door in July of 1650. He left a portrait of himself in a pretty nice frame, regally carved from wood and gilded. His portrait is by Hyacinthe Rigaud. The list of illustrious visitors and owners goes on and on. Of all the chateaux in the Loire Valley, I think this one has the most fascinating history. And I certainly think it’s the most beautiful. You’re in! Is that a mop and pail in the hallway? You really must be early. No matter. You have the place almost to yourself for awhile, before tour buses arrive. Visitors meander quietly through the rooms. In every single room, flowers from the garden are freshly arranged. One of my favorite rooms is a small, fairly humble one: Thomas Bohier’s study. It has windows overlooking the River Cher on three sides, and an Italian-style coffered ceiling. Hung almost casually over the doorway is a masterpiece by Andrea Del Sarto, “Holy Family,” early 1500s. A very lucky full-time florist gets to arrange flowers every single day. He’s a true artist. Diane de Poitiers, beloved mistress of Henri II, received the chateau in 1547. Primaticcio painted her as Diana, goddess of the hunt. She added the iconic bridge across the River Cher. (It was still only a beautiful arched bridge in her time). Diane was twenty years older than the king, but she kept her beauty and charm. Part of her beauty ritual was a daily dip in the chilly waters of the Cher underneath her chateau. She probably used the landing where supplies were delivered to her kitchen by boat. She was also said to drink a beauty potion made with gold dust. Diane’s bedroom, with Renaissance furniture and decoration added in the renovation of the chateau that began in the 1950s, is lovely and evocative. After Henri II died from a jousting mishap in 1559, his widow, Catherine de Medici, immediately banished Diane from Chenonceau. She was given Chateau Chaumont instead: a very nice place, but Diane didn’t think so. Today, a later portrait of Diane’s nemesis hangs in Diane’s bedroom. I believe it is by an artist named Sauvage. Catherine de Medici looks stern–even nun-like. But actually she knew how to have fun. Once she was free to do as she pleased, Catherine extended the chateau right across the River Cher, building two stories of galleries on top of Diane’s graceful arched bridge. Catherine began hosting fabulous parties at Chenonceau. One of them was for the marriage of her son and Mary Stuart, known as Mary Queen of Scots. 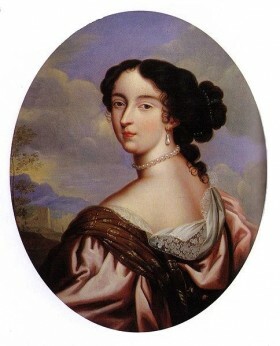 Mary was the “It” girl in France during her brief marriage to the Dauphin, who became Francois II for such a short time. In fact, Mary was celebrated as the “new Diane,” her features recognizable in the seated nymph in Francois Clouet’s 1550 painting, now in the Musee Des Beaux-Arts in Rouen (Public Domain). But I digress. Back to beautiful Chenonceau and Catherine’s galleries stretching over the river. I can imagine glowing candles, glittering jewels, and rustling silks at many a ball here. In World War I, the Grand Gallery became a hospital for injured soldiers. During World War II, the chateau became one of the few points of access to the Free Zone. The Menier family actively worked to smuggle people across the river and out of danger. But chateau life was not all fun and games all the time. Every chateau has a chapel. Chenonceau’s is beautiful. A later chateau owner, Madame Louise Dupin, saved the chapel when a rampaging mob arrived at the beginning of the French Revolution, with orders to smash all religious symbols. She had filled the chapel with firewood and claimed it was a storeroom. Actually, the people in town knew and liked her, so they may just have needed a convenient excuse to go easy on her home. 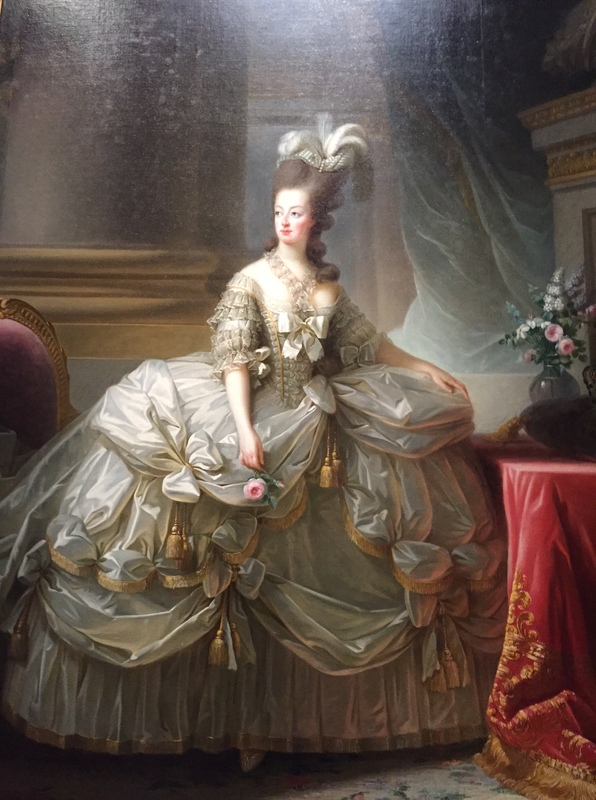 Jean-Marc Nattier painted her shortly before the Revolution. There are not all that many rooms in the chateau, but every single one is exquisite. I’d sleep well in this bed with my window open to hear the gentle flow of the river. I might even settle for being a lowly scullery maid if I could work in the prettiest kitchen I ever saw. It must have stayed fairly cool, positioned right above the flowing river. (OK, I do realize the working kitchen would not be full of fresh flower arrangements. But still). By the time I made it to the kitchen, crowds had arrived. 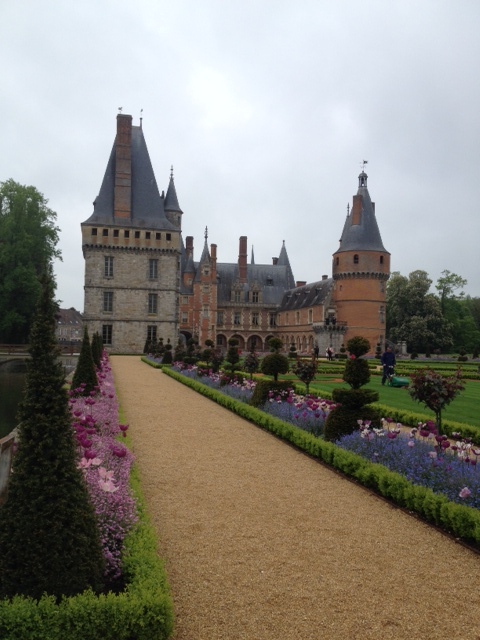 Time to head out to the dueling gardens: Catherine de Medici’s on one side and Diane de Poiters’s on the other. The outbuildings are charming too, set in real working flower and vegetable gardens. The florist has an entire building to himself. He was being filmed so I only got a brief glimpse inside at The Best Job in the Entire World. (Actually I was told, in rather rude French, to buzz off when I peeked inside, so I took a picture of another building instead). The gracious chateau restoration that visitors see today was begun in the 1950s by the Menier family of chocolate fame. (Gaston Menier had also covered all the expenses of the military hospital during World War I). Like so many historic sites, Chenonceau had begun sliding into ruin before it was rescued by people who cared about history and beauty. Sources: placards in the chateau, and a guidebook written by Alain Decaux of the Academie Francaise. Join me next time for more details about sublime Chenonceau! This entry was posted in Architecture, Castles and Palaces, France, Historic Homes, Historical Figures, Why I Love France and tagged Catherine de Medici, Chateau de Chenonceau, Diane de Poitiers, Francois I, Gaston Menier, Louis XIV, Mary Queen of Scots, military hospitals of World War I on September 14, 2018 by Claudia Suzan Carley. Not that many tourists make the trek from the over-the-top Palace of Versailles to the much smaller Petit Trianon, built as a retreat from the crowds that filled the main palace as soon as it was built. I like the much-more-human scale of the Petit Trianon. So did Marie Antoinette. OK, I’m sure her critics were correct in accusing her of hosting raucous parties there, but I’m sure she also appreciated the details in her more quiet moments. There’s a round salon with exquisite, soothing painted panels. 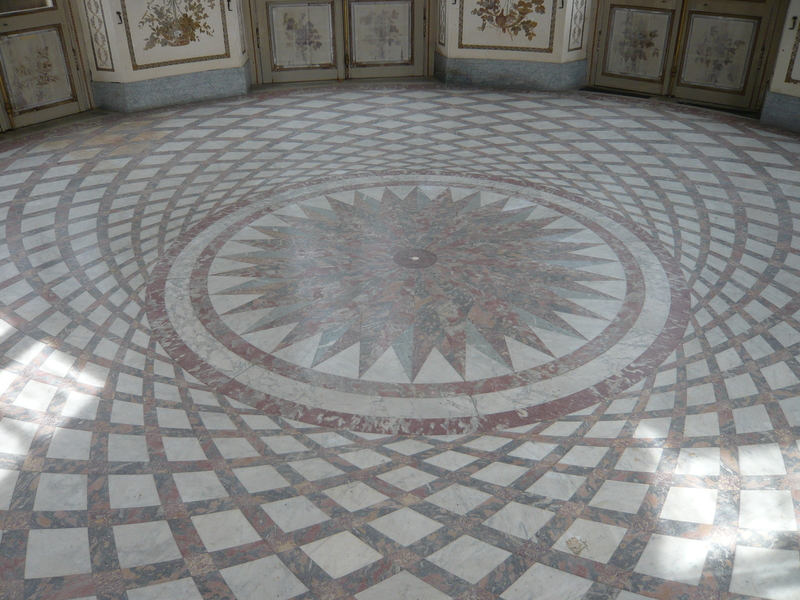 The salon has a patterned marble floor, still pristine. 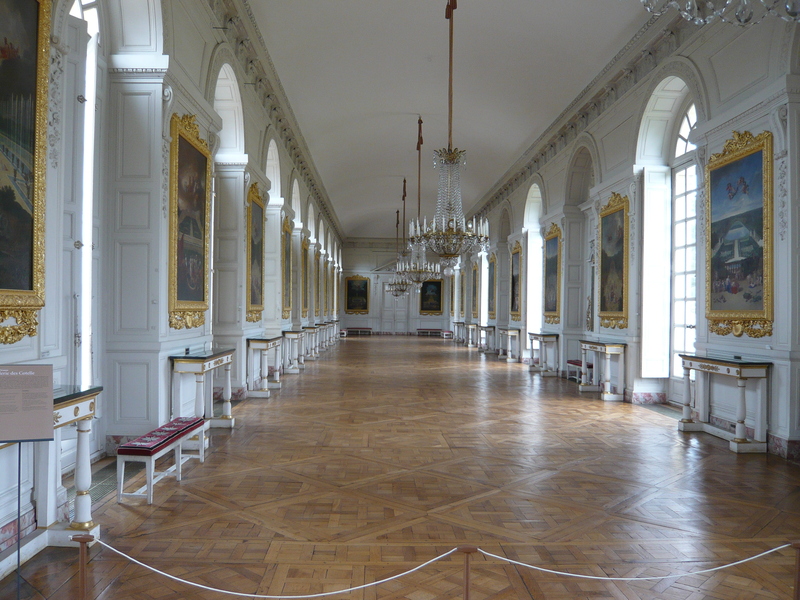 A long gallery is a mostly-white version of the main palace’s Hall of Mirrors. It’s calming, not frenetic. I think it’s too bad the royals who succeeded the glory days of the Sun King did not use the peace and quiet of their retreats to think about how they could sustain the monarchy. In nearby Paris, daring thinkers were meeting in obscure coffeehouses, sowing the seeds of revolution. 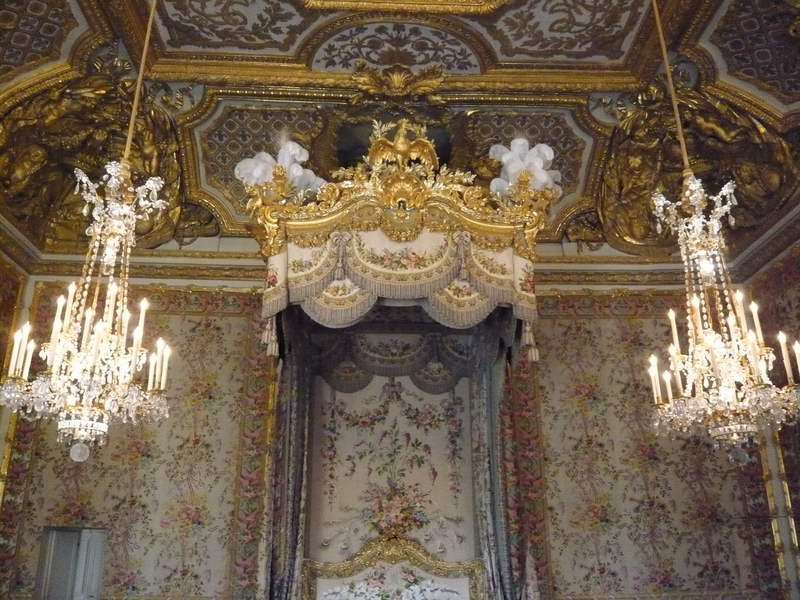 This entry was posted in Architecture, Art, Castles and Palaces, Explore Europe, France and tagged French Revolution, Louis XIV, Louis XV, Marie Antoinette, Palace of Versailles, Petit Trianon on April 14, 2015 by Claudia Suzan Carley. Even the Sun King himself sometimes tired of the over-the-top splendor he had created at Versailles. 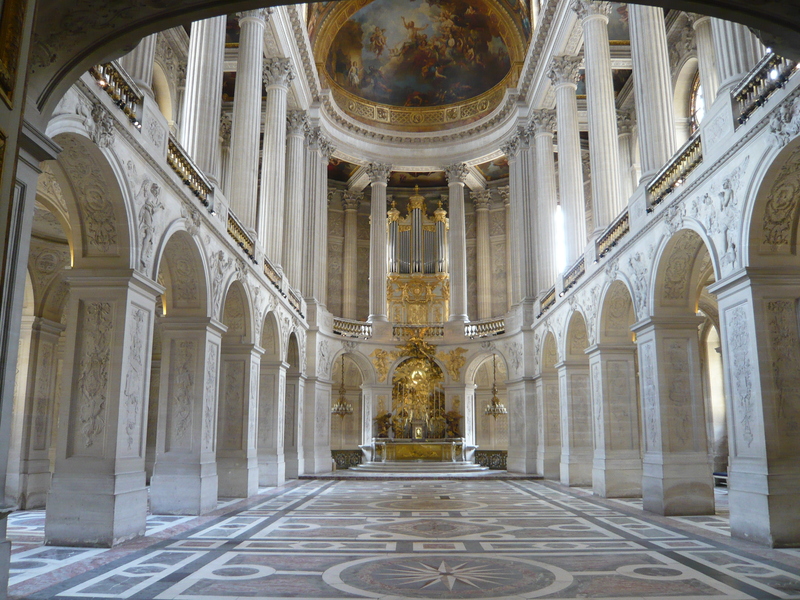 He heard Mass daily in his spectacular Royal Chapel, around 10:00. I read somewhere that courtiers attending mass were seated such that they looked at the King in his elevated gallery. Right now I can’t verify that, but it makes some sense. 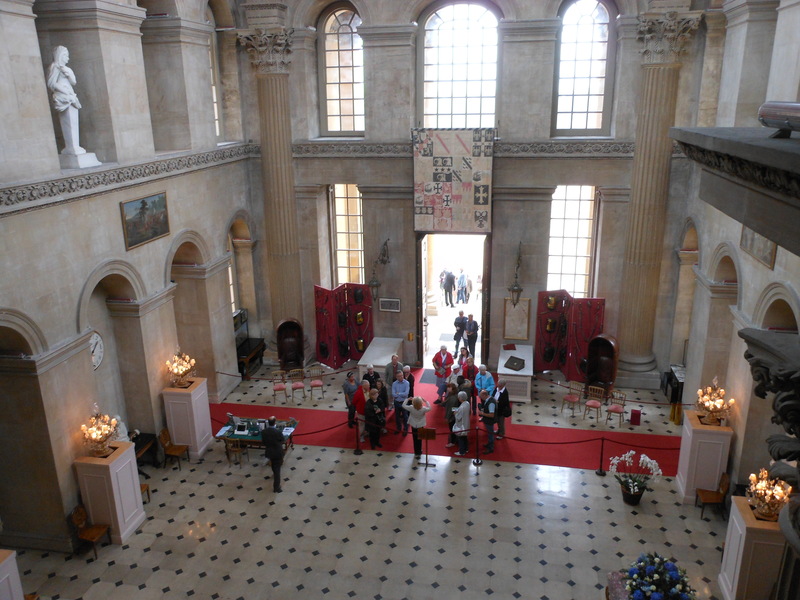 The chapel was built and carefully decorated to celebrate the association between Louis XIV and his namesake, the only French king who became an actual saint: Louis IX, AKA St. Louis the Confessor. Louis XIV was anything but saintly in his younger years. He built a smaller palace, the Grand Trianon, as a private retreat where he could take his mistresses and closest friends. It originally had a facade of blue and white porcelain tiles, following the rage for Delft tiles. But the tiles deteriorated quickly. 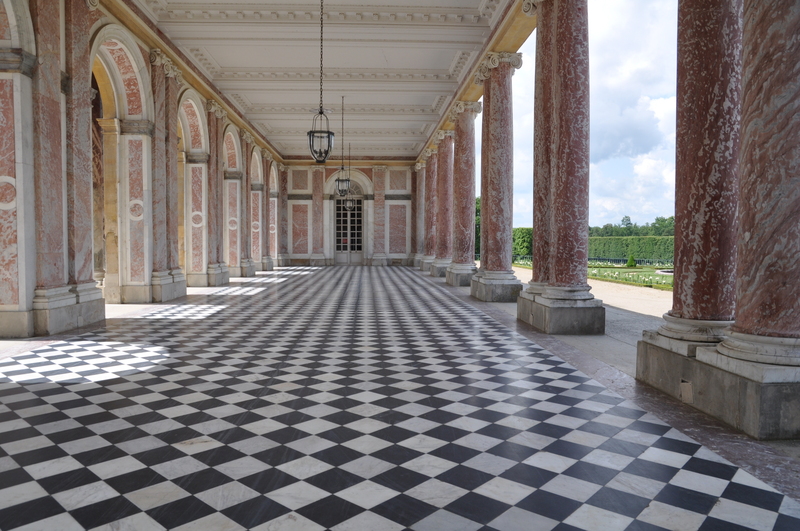 The Grand Trianon was rebuilt in red marble. By the time it was finished, in 1688, the Sun King had repented of his wild youth and “secretly” married the Marquise de Maintenon. 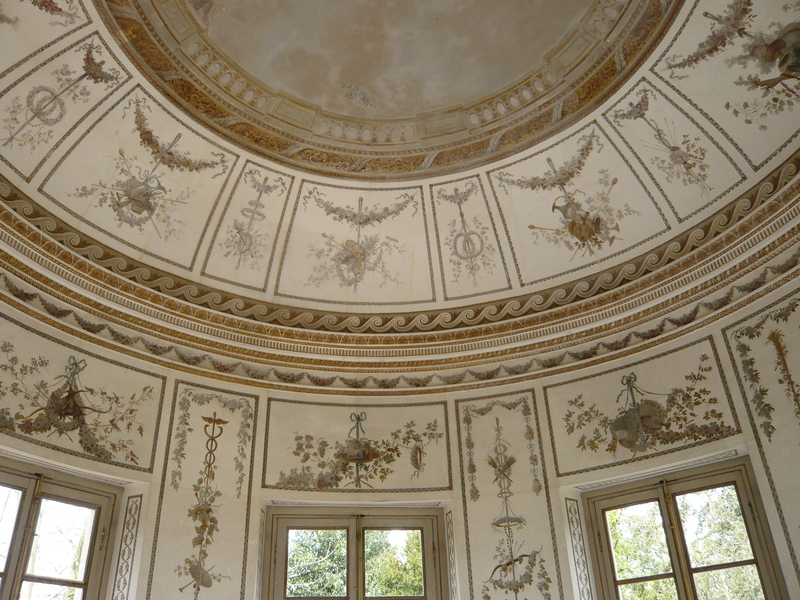 Louis XV, the successor to the Sun King, built himself a smaller palace yet: the Petit Trianon. Not many tourists make the trek to see it. Marie Antoinette famously frolicked with her friends in the Petit Trianon. It’s my personal favorite at Versailles. 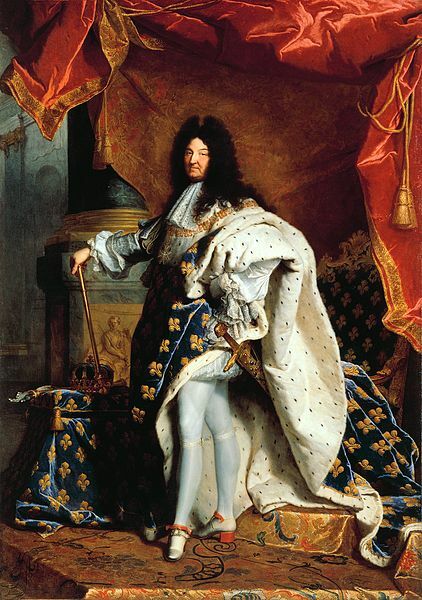 Louis XIV ended up spending a lot of time away from Versailles altogether, once he had all his nobles gathered there where he could control them. Instead he went off to the absolutely charming chateau that he gave to the “secret” wife who tamed him in his old age. It seems that even an absolute monarch with the world at his feet eventually can settle down. Madame de Maintenon came in for a lot of criticism for taking the King away from the goings-on at Versailles, but I like to think the two of them were very happy together. 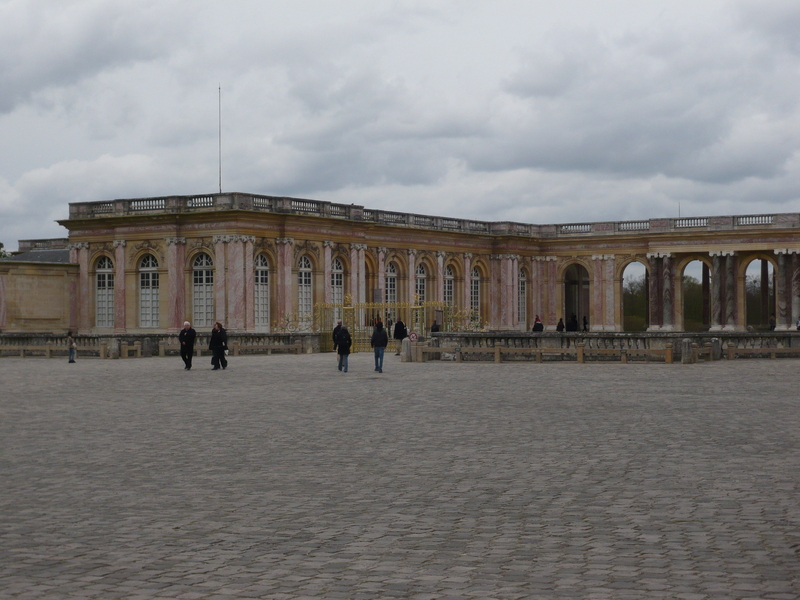 This entry was posted in Architecture, France and tagged Chateau de Maintenon, Grand Trianon, Louis IX, Louis XIV, Louis XIV secret marriage, Louis XV, Marie Antoinette, Marquise de Maintenon, Palace of Versailles, Petit Trianon, St. Louis the Confessor on April 10, 2015 by Claudia Suzan Carley. 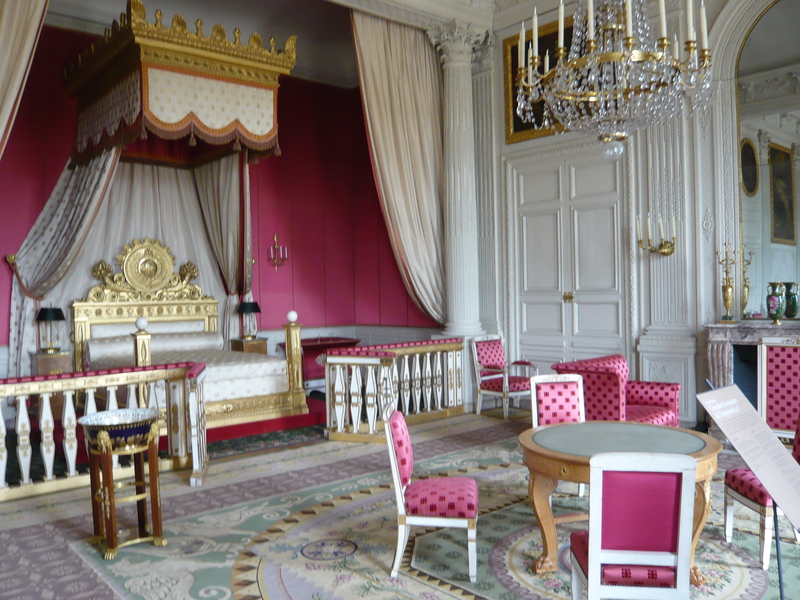 Why bother to stay overnight in the town of Versailles? 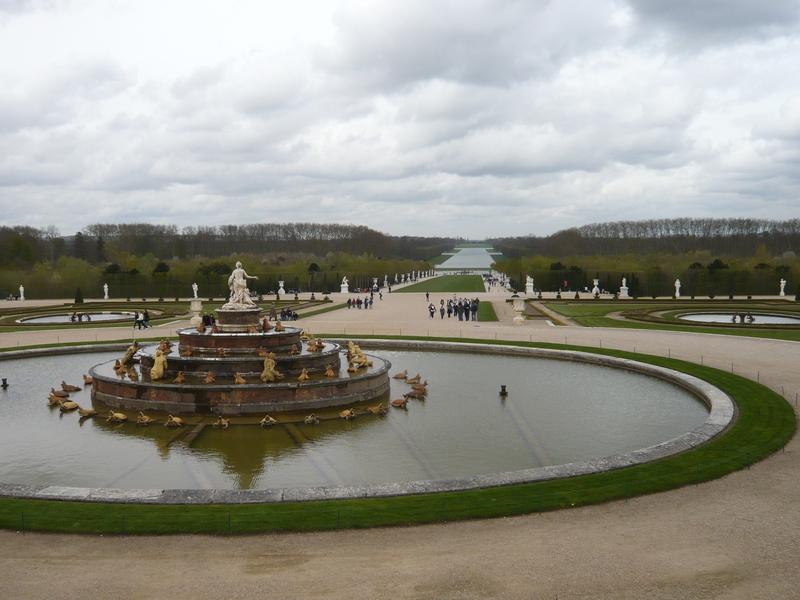 Most people do Versailles as a daytrip from nearby Paris. The picture above shows the best reason to spring for an overnight. 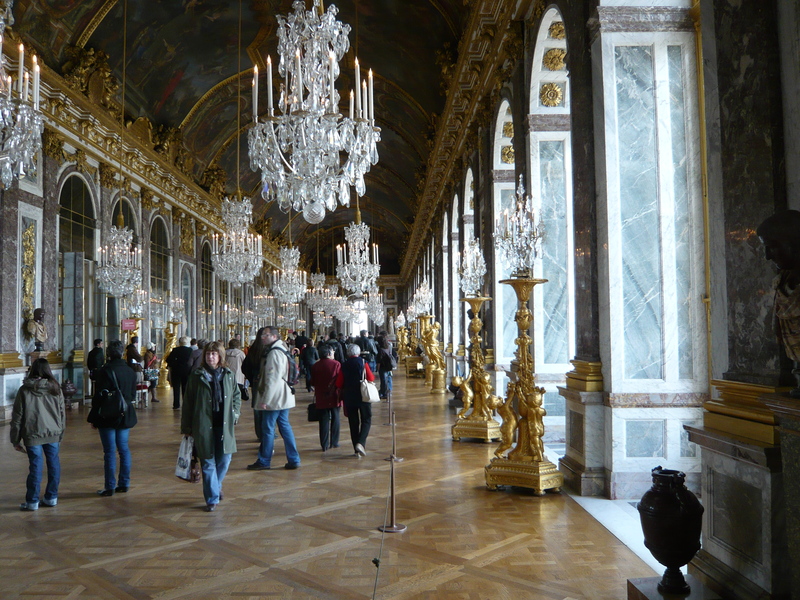 It’s the Hall of Mirrors, built by Louis XIV in 1678 and crammed with people ever since. On one memorable day, after an overnight in Versailles, I managed to appear early at the entry with ticket already in hand. Success! I had arrived early enough to be THE VERY FIRST PERSON to walk the length of the glittering room. I was so awed that I didn’t take a picture. The one above was taken by a person with more presence of mind. This picture above was taken about 20 minutes later. On busy summer days–which I would avoid– tourists shuffle along almost shoulder to shoulder. But once in my life, I had the place all to myself. I doubt that even the Sun King himself had that privilege, unless he managed to do it late at night after courtiers had turned in. The King invented two ceremonies which bookended his day: the Lever, when invited courtiers watched him get up, and the Coucher, when he was tucked in for the night under his grand canopy festooned with ostrich feathers. Like everything else Louis XIV did, these ceremonies inflated his ego and made people think they were lucky to even be in his presence. Trouble was, he made his bed and then he had to lie in it. In actual practice, the King sometimes did get up way early to go hunting, but Louis XIV valued ceremony so much that he would return to bed in order to properly get up all over again. 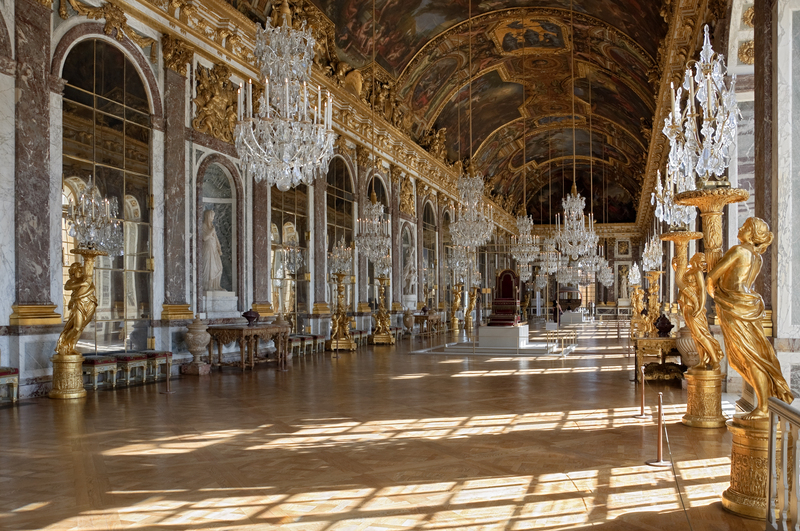 It’s hard to appreciate the overwhelming scale of the Palace of Versailles–and the Sun King wanted everyone to be overwhelmed. I do better getting off to the side and lingering over some details, like this corner of the Hall of Mirrors. Images of the Sun King are everywhere. He could have invented the modern term “self-esteem.” He famously remarked, “L’Etat, c’est moi,” meaning “The State, it is me.” That worked out pretty well for him, but not so much for his offspring. Louis XIV also once remarked, “Apres moi, le Deluge.” That loosely translates as, “After me, all hell breaks loose.” He had that right. His descendants managed to hold on to their riches and absolute monarchy for only two generations before the Revolution changed everything. 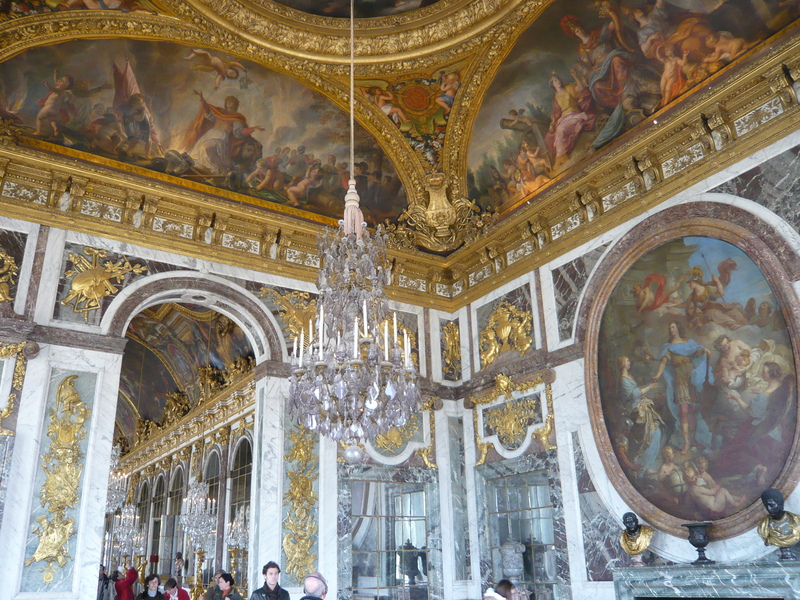 This entry was posted in France, Historical Figures, History, Paris, Paris Museums, Paris Sights and tagged "Apres moi, "L'Etat, cest moi", Hall of Mirrors, le Deluge", Louis XIV, Palace of Versailles, Sun King on April 8, 2015 by Claudia Suzan Carley. Before there was Napoleon Bonaparte, there was Louis XIV, the Sun King. He believed himself the greatest monarch the world had ever seen, so naturally he thought he might as well control all of Europe plus the British Isles, not just France. In 1704, the War of the Spanish Succession had been going on for four years, and things were going well for the French. Unlike many kings, Louis XIV was actually a soldier, and an accomplished one. He met his match in John Churchill, who had risen through the ranks after beginning at court as a lowly page. He had already attained the rank of First Duke of Marlborough when he stopped the French in their tracks. He changed the course of European history. Churchill/Marlborough did this through a combination of deceptive communications and wily maneuvering of his forces. As I understand it, he marched his troops undetected through the Low Countries, pretty much surprising the French at a little Bavarian village called Blenheim. The object was to keep the French from occupying Vienna, which would have broken up the delicate and ever-shifting balance among European powers. 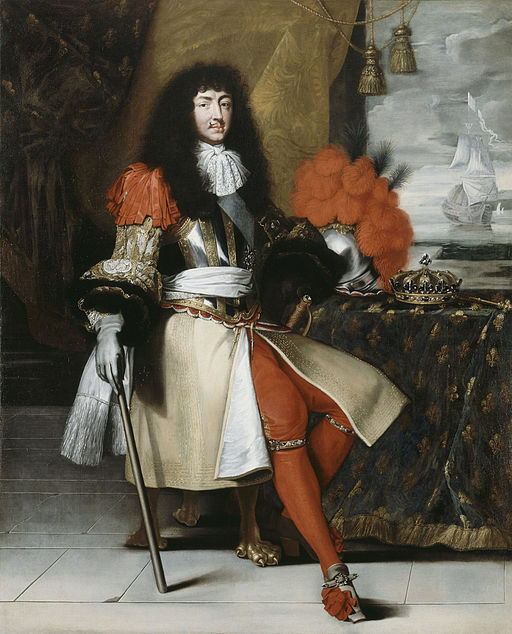 Marlborough’s heroics ended Louis XIV’s dream of controlling all of Europe. The French suffered 30,000 casualties. The French commander-in-chief, Marshall Tallard, was captured and hauled to England as a prisoner. There were still battles left to fight, but the battle of Blenheim was a huge turning point in history. A grateful nation gave the 1st Duke of Marlborough the lands and the money to build a suitable tribute, a palace that would rival the Versailles of Louis XIV. In fact, the cavernous entry hall at Blenheim is as impressive as anything I’ve seen at Versailles. It’s more austere, though–suitable for the military theme of Blenheim. The palace was built in the English Baroque style, and contained 187 rooms. The construction was halted in 1711, after the Duchess of Marlborough had a terrible quarrel with Queen Anne. In fact, the Duke and Duchess had to go into temporary exile on the continent until the Queen died in 1714. After that, the Duke had to spend his own money to complete his palace. Serious historians would not be much impressed by my analysis of the military situation. If I wanted to fully understand the War of the Spanish Succession and its many battles, I could study a large military exhibition at Blenheim Palace. I thought about the military exhibit on my recent visit, but the tearoom was calling my name. 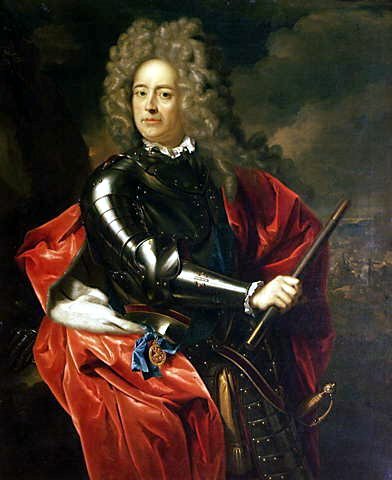 This entry was posted in British Isles, Castles and Palaces, England, Historic Homes, Historical Figures and tagged 1st Duchess of Marlborough, 1st Duke of Marlborough, Battle of Blenheim, Blenheim Palace, John Churchill, Louis the Sun King, Louis XIV, Queen Anne, War of the Spanish Succession on November 6, 2014 by Claudia Suzan Carley.